Le Corbusier may be best known around the world for his innovative and iconic architecture, but he actually began his eventful career by designing furniture. Bringing together striking images of both familiar pieces—his metallic chaise lounge, his modular rooms—and lesser know works, many gathered here for the first time, Le Corbusier. 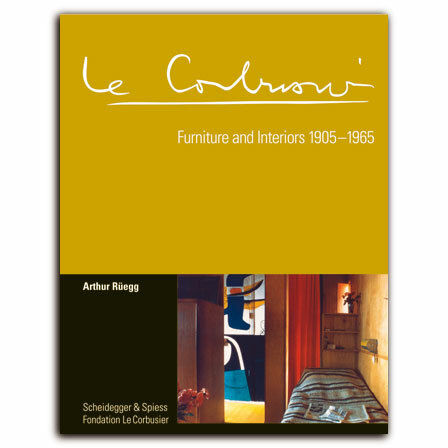 Furniture and Interiors 1905–1965 is the authoritative book on Le Corbusier’s work as an interior designer. After he moved to Paris in the early 1920s and adopted his now-famous moniker, Le Corbusier developed a particular interest in équipement, a term he coined for the essential furnishings of a residence. He focused specifically on tables, cabinets, and eventually the chrome and leather chairs—designed in collaboration with Pierre Jeanneret and Charlotte Perriand—for which he became famous. These pieces exhibit Le Corbusier’s trademark metal detailing and elegant austerity. After World War II, Le Corbusier shifted to more functional designs for use in everyday life. These wooden pieces resemble packing crates, evoking a rustic design aesthetic rooted in functionality. Stunning in scale and scope, Le Corbusier. Furniture and Interiors 1905–1965 follows the evolution of his style chronologically, making it an easy-to-use resource for both scholars and general readers. Entire apartments by Le Corbusier are described in careful detail with complementary images. Drawing upon previously unpublished material and new research, this equally well-designed book contains hundreds of illustrations, making it an invaluable resource for art historians, dealers, and collectors. Winner of the DAM Architectural Book Award 2012.